Along with the MIDI test file you can find a readme file that explains what it does and how to use it. I also have all the MP3 DPBSD sound clips and pictures of the various analyses located there for your listening / viewing pleasure. Analysis entails playing the MIDI file on the DP (many DPs will play MIDI files directly, otherwise you would use a MIDI sequencer here), digitally recording the response in stereo (many DPs will record WAV or MP3 files directly, otherwise you would use an external digital recorder here), and then uploading the resulting MP3. - Kurzweil Forte (both the German and Japanese piano voices). - Anything fully sampled (i.e. no looping or stretching) as I have almost zero interest in loopers. I find modeling somewhat interesting, but have probably heard PianoTeq enough (and one can always download the demo). *This file is meant to be used as something of a spot-check for various instruments and sample sets, perhaps as a go/no-go test before considering a purchase, and is in no way exhaustive. While a more comprehensive file could be easily made, it would produce a larger result file that would require more labor and time to evaluate. 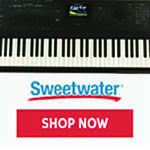 Readers should take these technology reviews for what they are, which is one aspect of the full digital piano. Sound technology is a large aspect, but there are other aspects that should be considered as well, such as whether it sounds similar to a particular physical piano (Steinway, Bosendorfer, Yamaha, etc. ), how the keys feel and respond, price, the loudness and frequency response of any built in speakers / amplifiers, intuitiveness of the user interface, electrical interfaces (pedal inputs, audio outputs, USB, etc. ), overall weight and physical robustness if it needs to be moved often, inclusion and quality of other voices, expensive cabinetry and other aesthetic issues, etc. Whatever you do, promise me you will never buy any musical instrument sight-unseen or merely on my or anyone else's say-so. Go out and play a bunch of them (bring some good headphones!) and see what suits you and your situation best. But do educate yourself as much as possible beforehand. Forewarned is forearmed. 1. Sympathetic resonance is the sound produced by elements of an acoustic instrument that are indirectly excited. Examples here are unplayed piano strings with the sustain pedal depressed, or a snare drum sitting near a loud stage monitor. The sympathetic resonance of undamped piano strings can be somewhat subtle, but can add lushness, believability, and richness to sampled or modeled pianos. Damper pedal sympathetic resonance is often simulated (or "modeled") with delay effects similar to short reverb, and when poorly implemented can cause strange buzzing or other annoying sounds or resonances. Better multi-layer sample sets use pedal down velocity samples to capture sympathetic resonance, with an equal number of layers captured with the pedal up and the pedal down being the norm. Modeled pianos usually have realistic pedal sympathetic resonance, particularly if the string models themselves are excited to create it. Note that somewhere between D6 and A6 is the highest key on a real piano to have a damper, so notes played above this point should not damp after pedal up or key up, and always resonate in sympathy to any notes played. In addition, "duplex scale" is the sympathetic resonance of the unplayed but harmonically related section of string that is located between the bridge and the hitch pin, or special resonant bars. 2. Except for the very highest notes, the strings of a real acoustic piano have individual dampers associated with each key on the keyboard. Imagine the scenario where one or more keys are either pressed slowly so that the notes aren't played, or are played normally but allowed to decay to silence. As long as the keys are held down the individual dampers associated with them remain lifted from their strings, and these strings are then able to resonate in sympathy with other notes that are played. There are many names for this, many of which I find confusing (a popular one is "string resonance" which is so generic as to be non-descriptive) so I call it "key sympathetic resonance." This effect is even more subtle than pedal sympathetic resonance. 3. When a key is pressed on a real acoustic piano, the hammer is flung at the string with a velocity proportional to how hard the key is pressed. If the key is pressed very lightly, the hammer velocity will be so low that it will not reach the string before falling back to rest, and no sound will be made. If a note is played normally, and if the pedal is held down so that the damper for that note is not allowed to fall, then replaying the key very lightly should not interrupt or disturb the continued ringing or decay of the note. Basically, this test swaps the two different ways one can lift the damper on a string that is playing, and does so in an overlapping manner so that the string should neither damp nor replay. Digital pianos often duplicate this behavior - I call this "silent replay". 4. The more mass a vibrating string has, the more difficult it is to quickly damp. Therefore the bass notes in particular on a real acoustic piano can be damped for a brief period of time but still retain some vibrational energy. This test employs the sustain pedal to apply two brief damps to a playing bass note. I call this behavior "quick partial damping". 5. When a played piano key is sustained via the damper pedal, normally the pedal is depressed before the key is lifted. But often (due to inexactness on the part of the player) the piano key is lifted a split second before the pedal is depressed. For bass notes on a real piano, the string should be partially damped at key-up, but then ring on at a reduced volume once the pedal is depressed, with the volume reduction directly proportional to the damping time (time between key-up and pedal down). This can be thought of as a variation of the quick partial damping test, but with more focus on playability. Digital pianos that don't support this feature may be more difficult to play, as they will likely be more sensitive to sustain pedal press / key lift timing. I call this behavior "late pedal partial damping". 6. Half pedaling refers to the response of an instrument that supports intermediate positions of the sustain pedal. Virtually all digital pianos respond to the sustain pedal being fully up or down, but many, like real acoustic pianos, undamp the strings more the farther the sustain pedal is depressed. Physically playing such an instrument requires a continuous pedal controller plugged into a keyboard that supports a continuous controller for the sustain pedal. 7. Sample looping refers to a form of individual sample compression, where the end of the sound sample is chopped off and replaced with a loop (short sound clip which is played over and over) with a decay envelope applied. Most digital piano sample sets are looped. Since the loop is cyclic in nature, it can't easily reproduce multiple strings slowly interbeating, harmonics with complex decay rates, longitudinal modes, etc. so there are timbre differences between the real decay and the looped decay. Sometimes a difference in pitch or stereo image is perceptible between the sample and the loop. The transition from sample playback to loop playback is usually crossfaded in order to make it less abrupt and obvious. The decay rate is often faster than normal, presumably in an attempt to partially hide the looped sound, but this fast decay itself often sounds unnatural. Loops may be highly processed to hide their cyclic nature, but this tends to make them sound unrealistically static and dull. Better looping is accomplished with a relatively long attack sample followed by a loop sufficiently long to support a realistically "phasey" string decay sound. The best looping is only done after the attack sample has significantly decayed in volume. Modeled instruments, because they don't rely on samples per se, should exhibit no looping. 8. Sample stretching is a form of sample memory space compression, where samples for certain notes are replaced with pitch stretched versions of samples from adjacent notes. 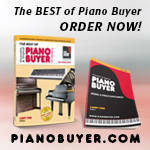 Most digital piano sample sets are stretched. Mild stretching might use one note, say C4, stretched up one half step to play the note C#4, with the next real sample being D4, which is stretched up for D#4, and so on, which reduces sample memory requirements to roughly one-half of full sampling. More severe stretching might stretch a single sample up and down one half step, which would reduce sample memory to roughly one-third the size of full sampling. Stretching is often non-uniform across the keyboard, with the lowest and highest notes stretched more (i.e. fewer samples stretched over more notes). For instruments other than piano, stretching is often used to create higher and/or lower pitches than the actual instrument being sampled can physically produce. The problem with stretching is that there are tones in real acoustic instruments that are fixed (sympathetic strings, soundboard, resonant cavities, etc.) whose pitches are also stretched when the note is stretched, which can sound unnatural, particularly when playing chromatic runs on an excessively stretched digital piano. Better sample sets are not stretched, and may have terms like "all notes sampled" to indicate this. Note that a stretched sample set may still be multi-layer and/or looped. Modeled instruments, because they don't rely on samples per se, should exhibit no stretching. 9. If the desired Note (e.g. C4) is an index into a one dimensional sample set, then Velocity in a "multi-layered" instrument is a second index into what can be thought of as a two dimensional sample set. Multiple samples of the same note are recorded at different velocities to better capture the natural dynamics of the instrument, and one particular sample from this set is selected for playback based on how hard the note is played (velocity) on the keyboard. If there are three different velocity samples for a particular note, the sample set is called a "three layer" sample. Most digital piano sample sets are multi-layered. The amplitude of the sample being played back is scaled with velocity, which makes playing more dynamic and natural, and helps hide the transitions between layers. Layers are often further blended in various ways that partially or completely removes the layer switch timbre discontinuities. Note that a multi-layer sample set may still be looped and/or stretched. Single layer digital pianos may use variable filtering to approximate the change in timbre with velocity of a real piano, and by very definition should exhibit no layer switching (though the result is usually something of a mixed bag). When layers are employed to replicate distortion effects, such as in some sampled electric pianos, the layer switching may be very abrupt and obvious. Modeled instruments, because they don't rely on samples per se, should exhibit no layer switching. 10. 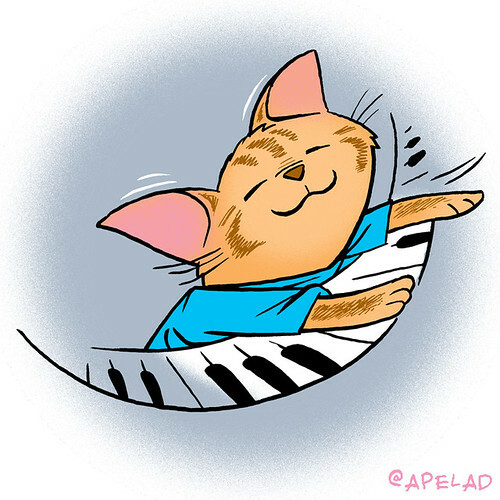 The highest keys on a real piano have no damper mechanism. The decay time for these notes is so short that a damper probably wouldn't affect playing much, and undamped strings are sympathetic resonant elements that can add richness to the sound of other played notes. The transition point between dampered and undampered is somewhere between D6 and A6. So obviously notes played above this point should not damp at key up (and obviously the damper pedal should have no influence over these notes either). Almost all digital pianos mimic this behavior by not damping the note at key-up (but probably very few model the sympathetic resonance element). Looping, stretching, too few velocity layers (and/or harsh layer switching), and fake-sounding or no pedal sympathetic resonance by very definition reduce the lush sound and rich variability of the originally sampled real piano. Not noticing these things initially is no guarantee that you won't be irritated by them in the future. And even if these crude sample compression techniques and cut corners aren't too obvious during normal playing, they can easily cause listener fatigue in the long term. This is something to consider, particularly if you are considering using a DP for primary practice. If you get tired of the sound because the sample set you've been listening to over and over was butchered down to 5% or less of it's original size, then you may find yourself MIDIing into a PC piano ROMpler, shopping for a new DP, or you (or your child) may even give up piano altogether. Good sound is inspiring; bad sound is discouraging. When you shop for a DP, I suggest you concentrate on those with the technically best sound you can afford, then narrow the choices based on the aesthetics of the sound, key feel, ease of use, etc. Last edited by dewster; 03/04/15 11:34 PM. If I get a chance I'll play with this with my Yamaha P-80. I like the sustained "C"'s going up in octaves at the beginning. Thanks! And glad y'all can see the files OK.
Like I said, a P-155 and PX-x30 would be great to add to this collection (as well as the P-80 Piano World, and the P-85 Snazz)! Any suggestions on a better file host, or is mediafire acceptable? Frank - for some reason I thought you were only into acoustic pianos. Interesting that you have a Yamaha P-80! I've been busy for the past couple of days. . . . The dewster has indeed been busy, and using his super powers for good, not evil! Great to see. This will be a very useful and interesting test file to use with various DP's and sample sets. Bravo! Now my opinion of you has gone up even more! Yes, but, are there limitations requiring the cryptic file names? I for one one, would appreciate more descriptive file names. Yes, but then the question would become (sung to the Ghostbusters Theme) "who you gonna kill . . .? " Cool! I have an XK-1 home on approval, and I think it's a keeper. Disclosure : I am professionally associated with Arturia but my sentiments are my own only. The dewster has indeed been busy, and using his super powers for good, not evil! I just uploaded am MP3 file. It is a very small sample set, measured in MB not GB. It is a sample set (not a VST) that is stored as a bunch of .WAV files with names like dc#2.wav and Pedal.wav I think I can hear most of what you are talking about. I did this mostly to make sure I understand the process. I used the 1.3 version midi file. You are free to change the filename to anything you like. 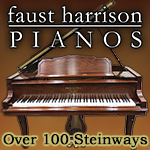 I have the 4 Ivory pianos uploaded to my mediafire account for now, although it sounds to me from your post that you'd like all these files in your mediafile folder. I'm not sure how to upload it to your account without your username and password but I'll upload them again if you'd like them in one place. Thanks very much for the files! I renamed them to have the dp_bsd version number of v1.3, and uploaded them to the share folder. I also updated the dp_bsd_readme.txt and removed the short reviews I had in there. There is a new file in the share directory dp_bsd_reviews.txt that has all my reviews to date. Your record levels are excellent! These samples in Ivory also sound quite excellent! The decays in particular are firmly in Pianoteq territory. - Ivory Bosendorfer Imperial 10, recorded w/ Reaper. - Nice long decays, no looping. - No stretching (all notes sampled). - Good dynamic range (~40dB, vel=1:127). - 8 or more layers. - C9 sounds pretty weird. - No response to partial pedaling. - Volume in MP3 file very good. - Ivory Italian 10' Concert Grand, recorded w/ Reaper. - Good dynamic range (~39dB, vel=1:127). - Nice pedal up sound. - 7 or more layers. - Ivory German Concert D 10, recorded w/ Reaper. - 6 or more layers. - C8 and C9 have a strange phasey sound. - Ivory Studio Grand 8, recorded w/ Reaper. - Nice pedal up and note-off sounds. Thanks for the sample! I renamed the file to include the dp_bsd version number and uploaded it to the share directory. Your recording level was fairly low, but otherwise the MP3 is fine. - Unknown small sample set from unknown Yamaha piano. - Looped, but fairly well done. - Rather rapid note decay. - Poor dynamic range (~30dB, vel=1:127). - Looping of higher notes fairly obvious. - Obvious stretching going on of some sort. - Does not respond to partial pedaling. 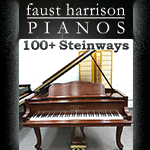 As you were checking out the Ivory files I just finished loading up the Garritan Steinway Professional MP3s. They're in the same folder. I used the v1.3 file again to make 5 recordings of the 5 different microphone positions (Under Lid, Player, Close, Stage Side, Classic). Despite how some of them sound, I made sure there were no effects being applied. There is a lot of natural reverb in some of those mic positions. Thanks for the new files setchman! I uploaded only the close miked MP3 as that was the only one I tested. The review file is now updated, which seems to kill direct links to it (sorry people, look in the directory for dp_bsd_reviews.txt). The Gerritan Steinway sounds very nice! I did hear some strange sounds deep into the decay of the notes, however. I'm getting better at seeing the layers with the spectral views in Adobe Audition - this sample set has 8. And, strangely, it looks like maybe two notes are stretched. - No real stretching (except for maybe a couple of notes). - 8 layers (from spectral PAN view). - No pedal or note-off sounds. - Strange breathing sounds (FFT?) in note decays near noise floor. and paw around. Every time I change a file and re-upload it, the old link dies. But it seems the directory link stays the same, so maybe we can live with that for a while. I know it's rather disorganized at the moment - if business picks up I'll deal with it as necessary. If people are interested in what I'm looking for in terms of detecting layers, stretched notes, looping, etc. I put a few Adobe Audition screen grabs in there too. For instance, stretching_spectral_phase_p120.jpg shows a spectral phase view of the stretch test (chromatic walk up the keyboard) of the Yamaha P120, where you can clearly see groups of three with identical phase - one sample is used to play all three consecutive notes. In layers_spectral_phase_ivory_bosey.jpg you can see the spectral phase view of the velocity layer test (middle C from vel=1 thru 127, step=2) of the Ivory Bosendorfer, where you can clearly see 4 distinct groups of identical phase - so there are 4 velocity layers. Sometimes the velocity layers show up better using the spectral pan view, and in layers_spectral_pan_garritan_steinway_pro_close.jpg you can see 8 distinct groups, hence 8 velocity layers in the Garritan Steinway sample. Finally, in looping_spectral_pan_p120.jpg you can see the spectral pan view of a note on the Yamaha P120. It starts out rich in harmonics, then about 3 seconds into the decay (@ the cursor) it turns into something that sounds wobbly and lamer, the dreaded LOOP!